The 2017-18 upfront advertising marketplace will once again defy gravity, proving that what goes down also goes up. That's the conclusion of an equities report issued by the research team at securities firm BMO Capital Markets Friday after its researchers discussed various upfront supply-and-demand scenarios with buyers and sellers attending upfront presentations. 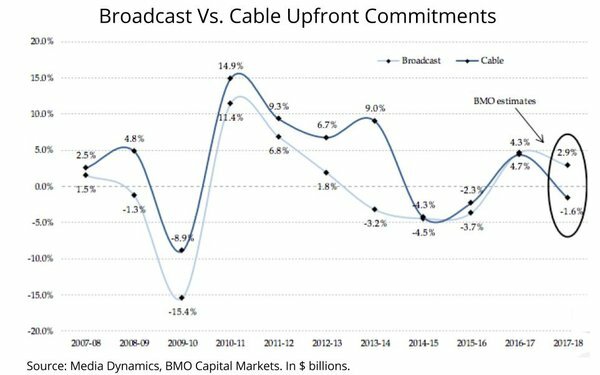 “We expect upfront broadcast volumes and pricing to be up slightly, while total cable dollars could decline as premium online video continues to take share from niche cable nets,” the equities researchers conclude. That scenario defies gravity, because once again the broadcast networks will grow share, as well as cost-per-thousands, despite an erosion of audience supply. 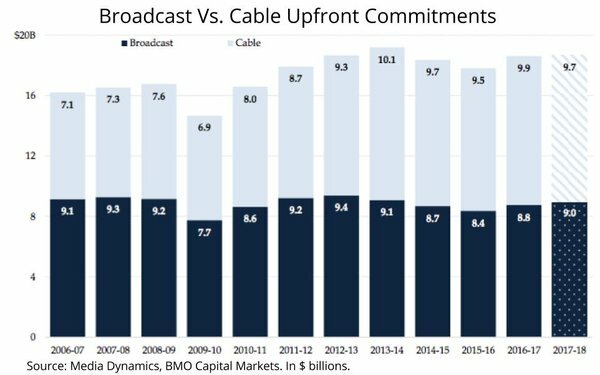 “Broadcast networks continue to see viewership and dollar share shift towards their sports properties, as the reality of prime-time entertainment ratings declines continues (STD total broadcast A18-49 Live+SD ratings are down 13% and down 22% on a C3 basis),” the analysts write, adding that the scarcity phenomenon does not have the same effect on cable budgets or prices, and they apparently are more demand elastic with the burgeoning premium video advertising marketplace than broadcasters are. “We believe general entertainment cable networks (like TWX’s TNT and TBS) should continue to do fine as they have major sports supporting their pitches, while a broad range of original programming helps these networks deliver mainstream reach across multiple key demos. “More niche networks -- including and especially more youth-oriented networks -- continue to face the biggest challenge from premium online video like Hulu and YouTube (via Google Preferred) as they increasingly capture youth/ millennial viewership,” the report concludes.